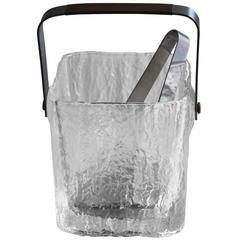 Sorry, Ice Bucket with removable glass bowl by Pedro Petry is not currently available. 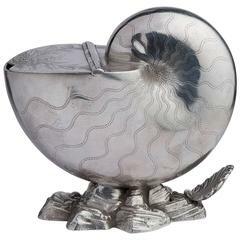 English Victorian Spoon Warmer named Nautilus , suitable also as ice bucket - O/3620. Whimsical nut bowl as sculpture. Green velum wrapped mahogany bowl with 24-karat gold gilded brass stem and nutcracker with carved walnut finial. 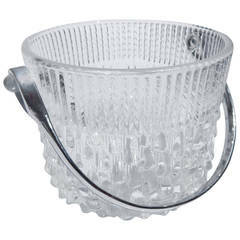 1960s modern glass ice bucket by Hoya Japan. 1960s Mod Glass Ice Bucket with Chrome handle and modern design. Marked made in France. French, circa 1960 A stunning silver plated ice bucket with rope design and turret shape top. 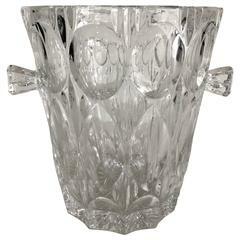 Crystal ice bucket with handles - celebrate with sophistication - a compliment to any bar - holds any bottle of wine or Champagne.